Every day, Mary Ann goes for a walk. She takes her dog, Bentley, who knows the way as well as she does. Together they walk through their hometown of Walhalla, North Dakota. It’s quiet there, especially in the morning, as they walk down the sidewalk towards the nursing home. The workers know the puppy, and he is welcome there. The nurses smile and nod at the two of them. Mary Ann walks through the hallways, Bentley dutifully leading the way. When they get to Joe’s room, the dog gets more excited. He nudges open the door. Joe turns his head, sees his wife and sees his dog. A smile breaks like sunshine across his face. There’s no trace of the illness, or sadness or tiredness. Bentley hops right up on his lap, his usual spot, with a face of pure joy. LaRae Horgan, a frontline specialist at Choice Financial in Walhalla, lives down the street from Mary Ann and Bentley. Sometimes she would see them in the mornings, walking to see Joe. And then, one day, Bently wasn’t there anymore. LaRae and her teammate, Sharon Soeby, have known the couple for many years. Sharon calls Mary Ann her “second mom” when they used to work together at the bank. The couple has four kids around Sharon and LaRae’s age, two daughters and two sons. Some moved away, some stayed. In 2010, the couple adopted a black and white Shih Tzu from the rescue shelter and named him Bentley. Two years later, Joe was diagnosed with Parkinson’s Disease. In 2016 Joe transitioned to a nursing care facility. 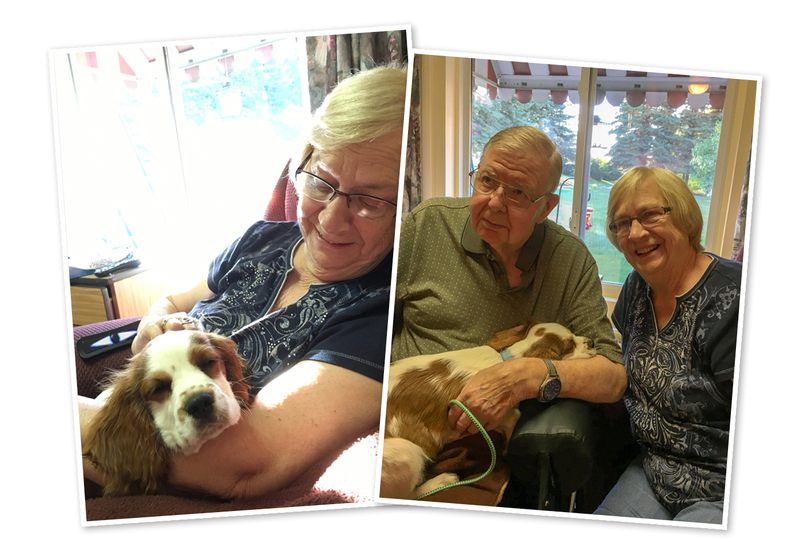 While it was difficult to be away from home, Mary Ann began her daily walks with Bentley to visit him. When Bentley died unexpectedly in June of 2017, it was devastating for both of them. And in the dog’s absence, something changed in Joe. LaRae knew she wanted to help. A few weeks after Bentley had died, she called up Joe’s daughter Laurie to ask if the family was ready to think about getting another pet. Yes, they were ready to start looking for a rescue animal, Janelle said — but it had to meet specific criteria to be allowed in a nursing home. The search was getting difficult. She explained that every month, each Choice Financial location likes to set aside Random Acts of Kindness (RAK) money. The money is to be used for special situations, big or small, where it can be put to good use and serve others. This was the first thing that came to mind when LaRae thought of ways to help. “When she told me about the idea, I thought it was perfect,” Sharon said, smiling. The rest of the team agreed. It was with a joyful heart that they presented Mary Ann, Joe, and their kids with a check to help them with new pet expenses. After that, the search didn’t take long. Pretty soon, they sent LaRae pictures of a droopy-eyed Cavalier King Charles Spaniel, just a few months old, yet perfectly calm. He was the only one not chosen from a litter of puppies. “They thought something was wrong with him when they went to get him — he would just lay there and hug you,” LaRae said. He was the perfect nursing home puppy and he met all the criteria. They named him Charlie. Bently keeps Mary Ann and Joe company. “They started calling the donation ‘Charlie’s Fund Money,’” Sharon said with a laugh. The family brought Charlie in to meet the Choice team, and everyone gathered around as if he was a newborn baby, LaRae said. They instantly fell in love with this puppy who accepted every hug. But the best moment was the big surprise. Mary Ann and her daughter walked Charlie down the street towards the nursing home. It was time to meet Joe. Once again, a little puppy led the way to his room and nudged open the door. Once again, a puppy took his place on Joe’s lap and nuzzled his face against his chest, tail wagging. A smile crept across Joe’s face, one they had not seen in a while.